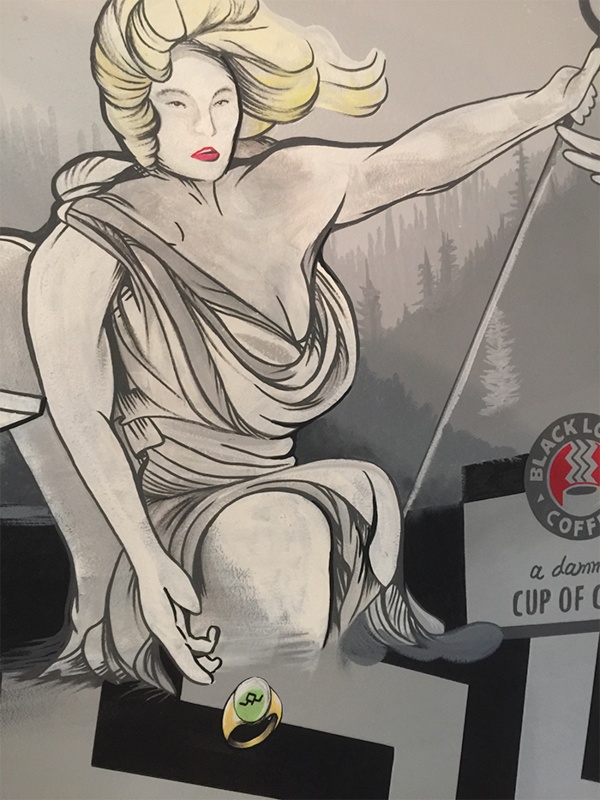 When I bought my house in Portland, I had a strong desire to personalize it with some unique art that was deeply meaningful to me. My whole life, I have always been fascinated by graffiti street art and urban murals. It occurred to me that a large wall mural would make an incredible centerpiece for my living room and truly make my home stand out like no other. 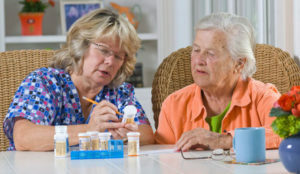 I am the first to admit that I am not an artist, in that I don’t have the skills to draw or paint. 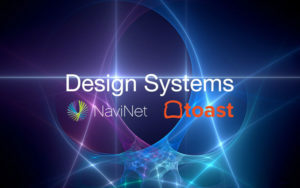 I am, however, very competent at coming up with creative concepts and visually communicating them to visual designers and other artists so that we can collaboratively bring them to life. 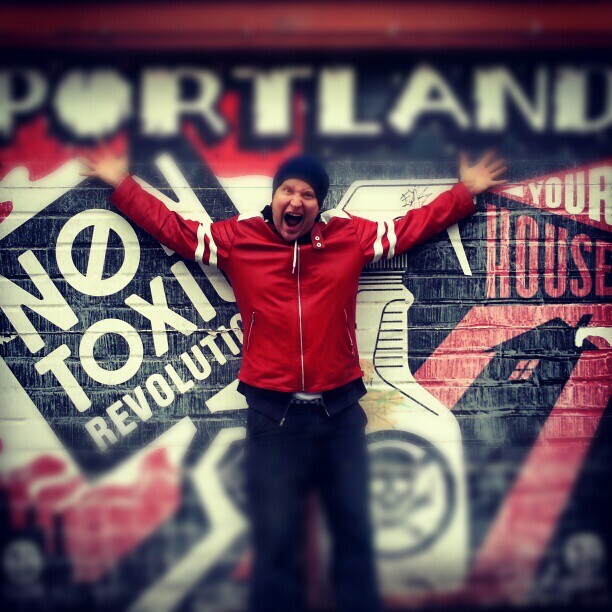 As I begin telling people I knew about my mural idea, a friend of mine serendipitously connected me with an amazing Portland-based mural and tattoo artist, named Eric Blackburn. 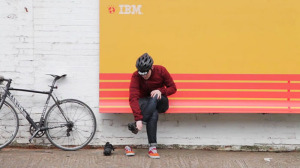 He ended up being the perfect partner in crime for this project. 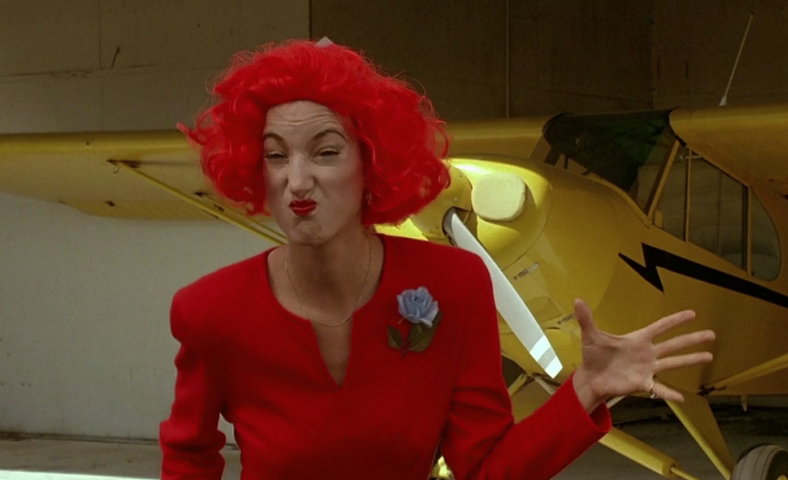 David Lynch’s Twin Peaks has long been my most favorite television show ever. I love the surreal nature of it, the quirky characters, the dreamlike supernatural elements, and its rabid cult following that has endured for over 25 years. I also always identified with it because it took place in a small town up in the Pacific Northwest, just outside of Seattle. 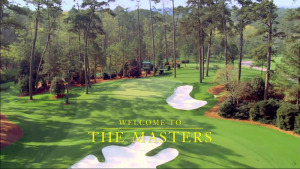 Having grown up in this part of the country makes the show even more special to me. 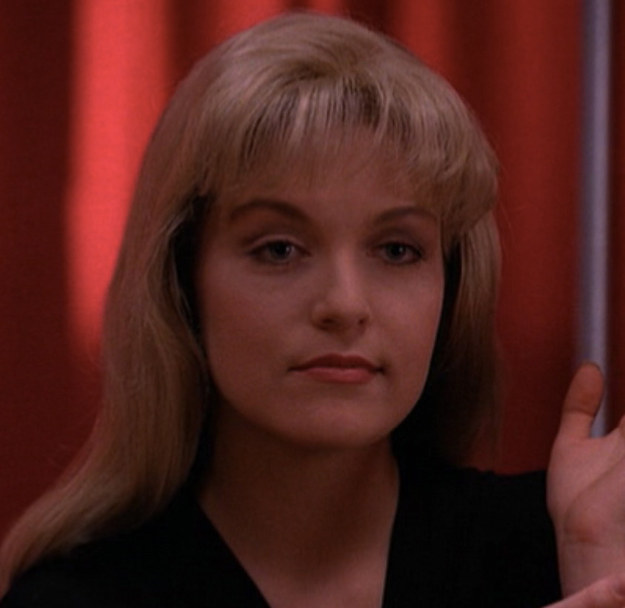 When I heard that Showtime was bringing back Twin Peaks after so many years, I was ecstatic. 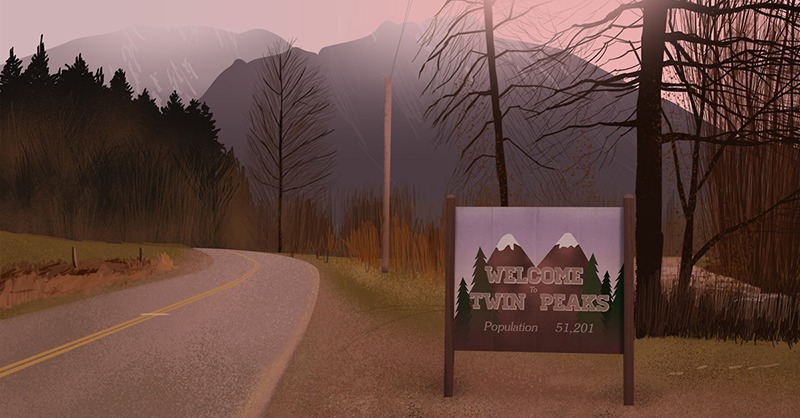 I thought what better way to celebrate than to come up with a mural concept that centered on the fantastical world of Twin Peaks. 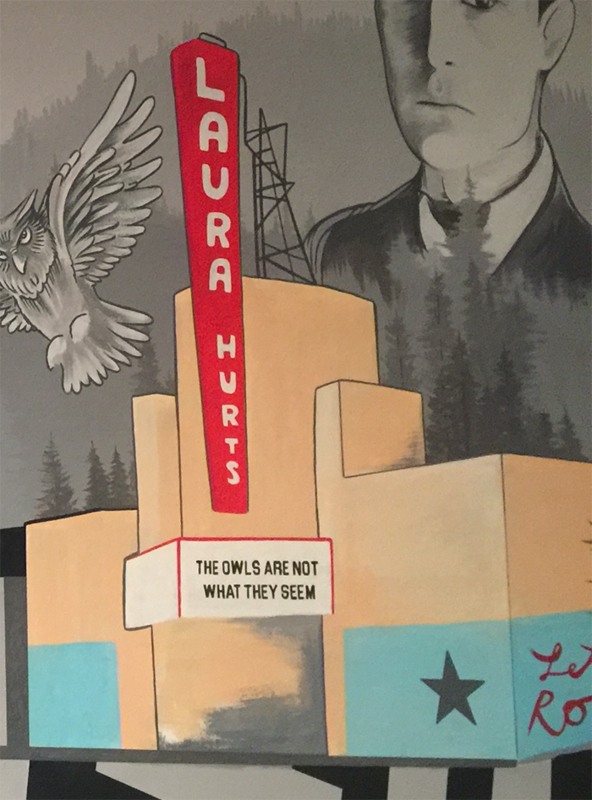 To localize the mural even more and simultaneously celebrate my hometown of Portland, Oregon, I decided that my mural would reimagine Twin Peaks as if it took place right in my own beautiful Southeast Portland neighborhood. In addition, one of my greatest artistic and musical idols had sadly passed away earlier in the year. 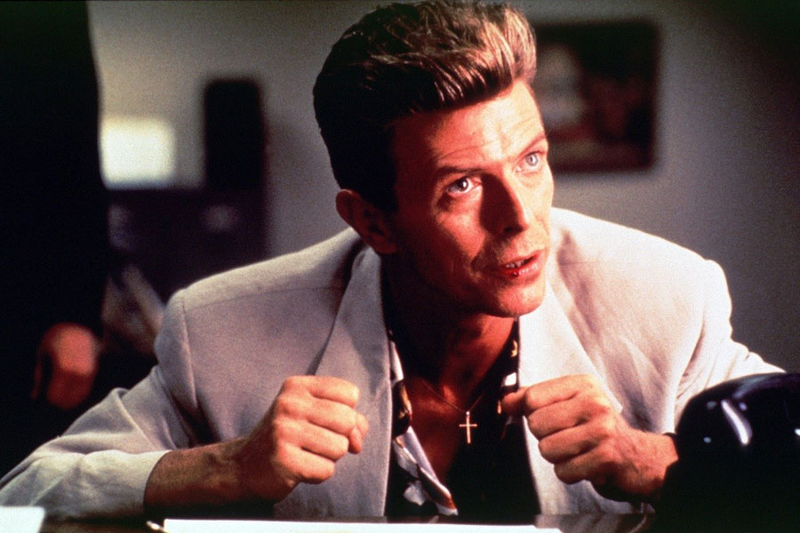 David Bowie was a prolific, fascinating person, who I first became inspired by after watching him bring the Goblin King to life in Jim Henson’s signature movie, Labyrinth. 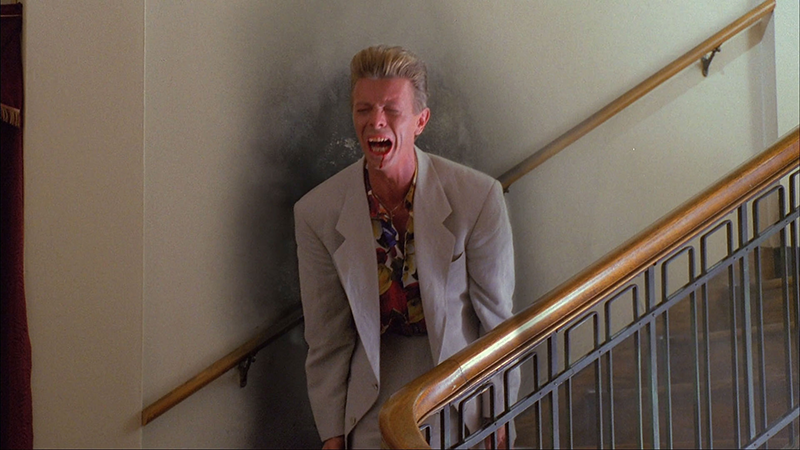 In the Twin Peaks prequel movie, Bowie played a small but memorable role as Agent Philip Jeffries, who suddenly disappeared from a hotel room in Buenos Aires and then randomly reappeared in the Philadelphia FBI Office, years later, clearly shaken and traumatized. He was supposed to return to reprise this character in the 3rd season of the rebooted series, which is set to premiere in May of 2017 on Showtime. Unfortunately, he died before filming took place though. 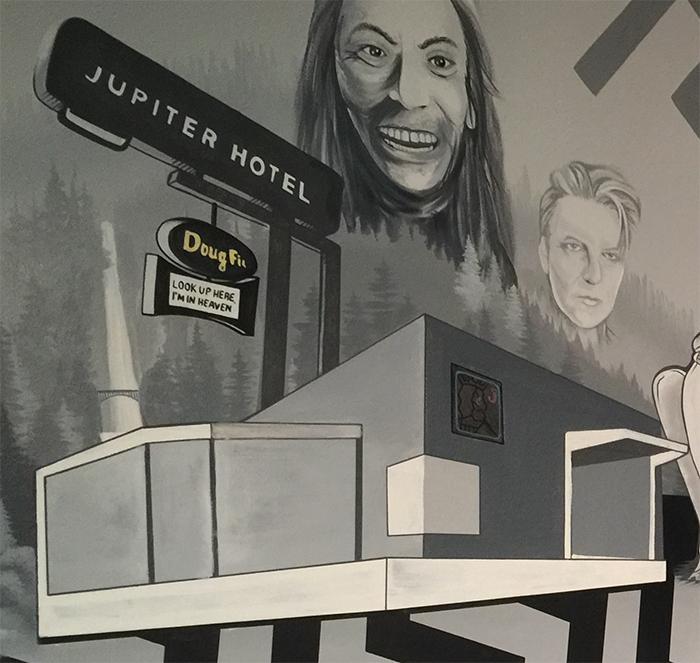 Therefore, I wanted to be sure that I also paid special tribute to Bowie in my mural. 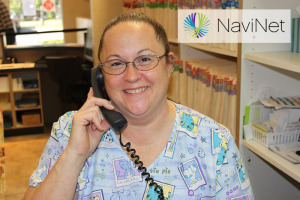 I quickly got to work scouring the web for inspirations. As I did this, I put together a rough collage to start thinking about the narrative for the visual concept, as well as the elements that should be included in the mural. After creating my low-fi collage, I continued to evolve my concept by creating a higher fidelity “prototype” to more accurately specify all the elements I wanted in the mural, to illustrate my proposed composition (how all the elements should be laid out), and to provide Eric with clear creative direction. I accompanied my visual prototype with a painstakingly detailed narrative, explaining all of the elements I included in the concept, as well as their symbolic meaning, inspiration, and background story. 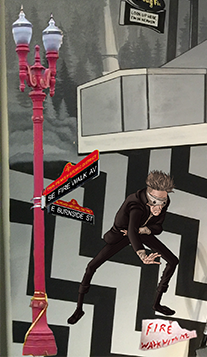 The setting of my mural is East Burnside Street, which is a major artery in Portland that cuts right through the Buckman neighborhood that my house is located in. 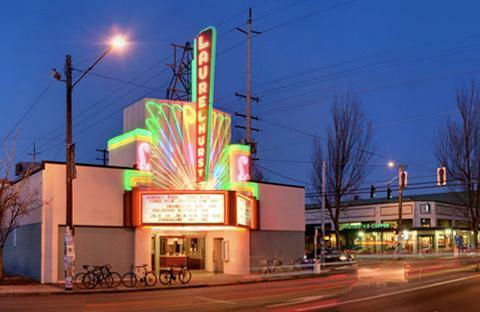 There is a vibrant business district on this street that includes one of Portland’s historic theaters: The Laurelhurst Theater. 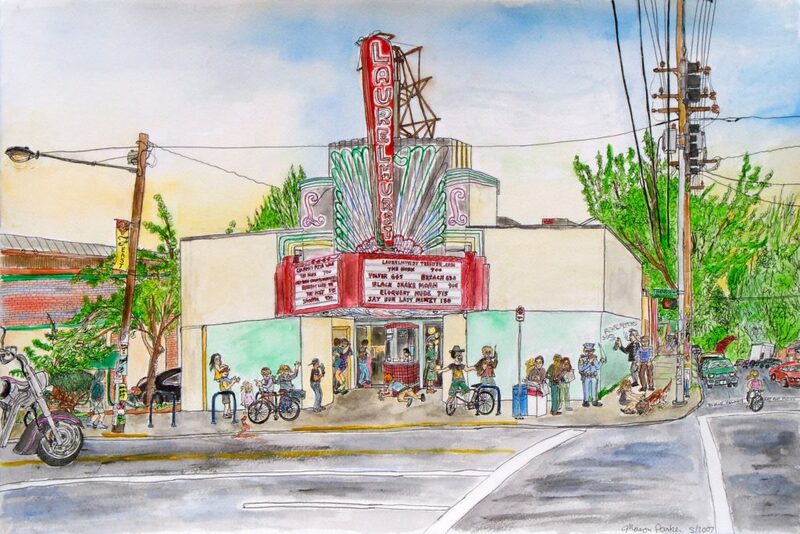 This Art Deco theater was initially constructed in 1923, and it has been an iconic landmark within Southeast Portland ever since. 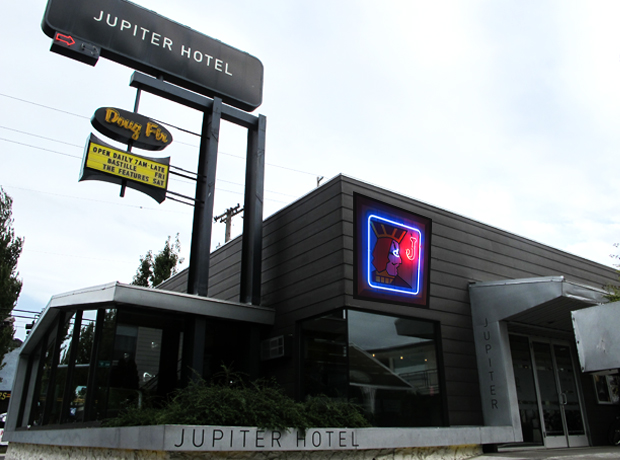 Further down East Burnside, going towards Downtown Portland, there is a very interesting place known as the Jupiter Hotel. 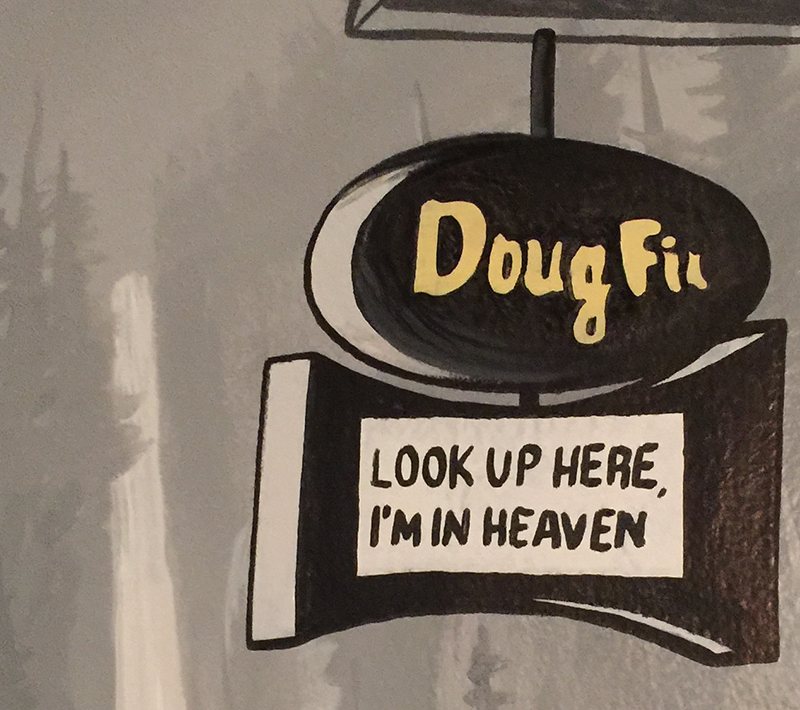 This hotel includes a unique bar and music venue called The Doug Fir that feels like a rustic lodge. 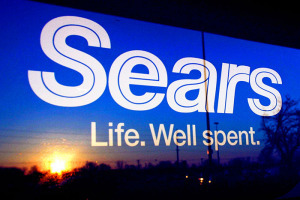 For me, it was an imperative that I incorporate both of these points of interest as central elements of my mural piece. 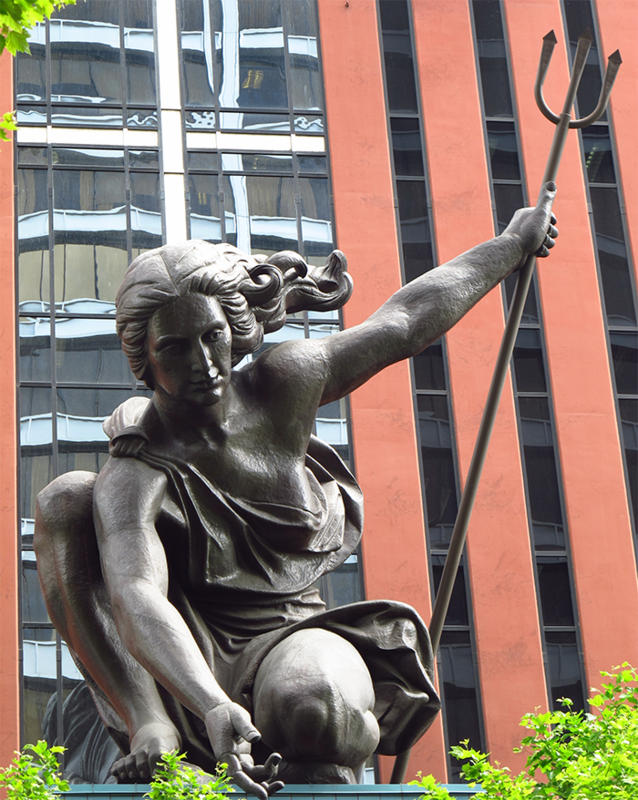 In addition, I wanted to include some other iconic Portland artifacts, such as Multnomah Falls, Mount Hood, the Portlandia statue, roses, and of course a coffee shop. 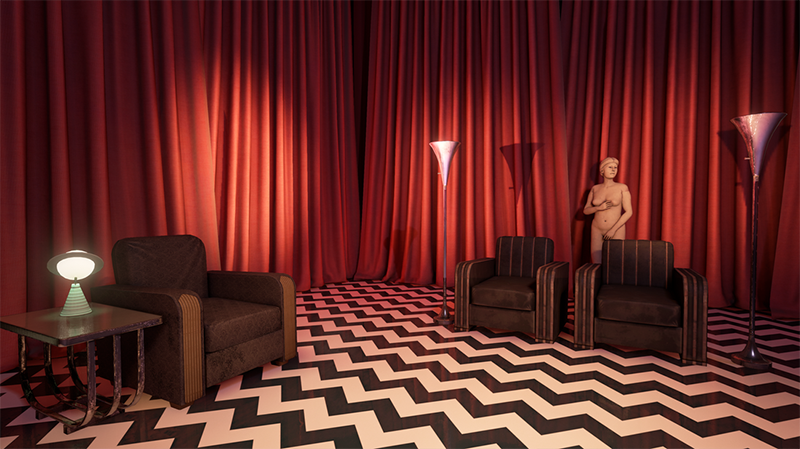 In my design concept, all of these elements simultaneously represent significant Twin Peaks references as well. Below are some examples of the doppelgänger double-meaning that the elements I chose embody. 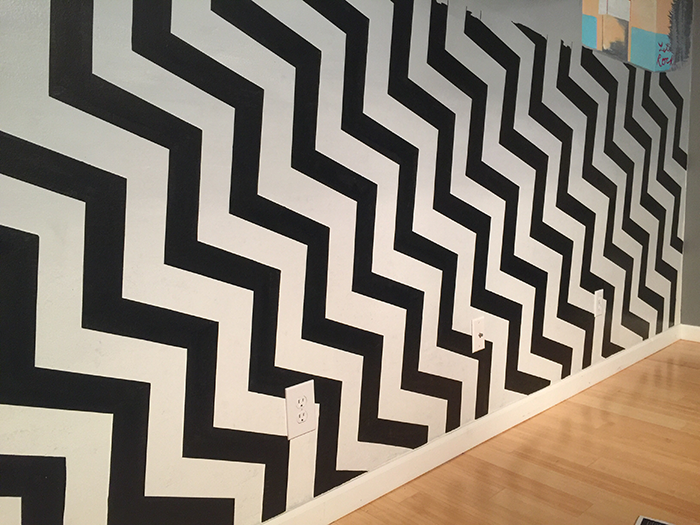 The wavy black-and-white pattern on the street of my mural concept represents The Black Lodge that exists within Special Agent Dale Cooper’s dreams, as well as the spirit world. 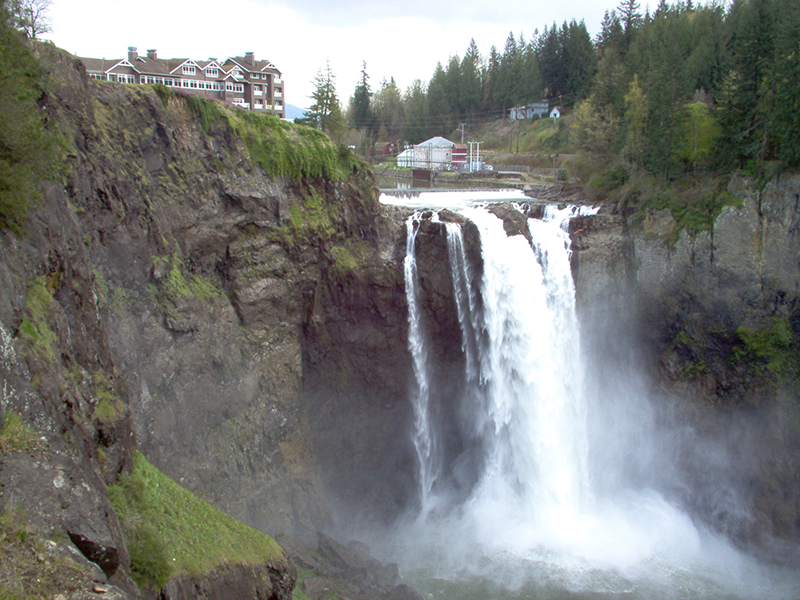 This is the setting of some of Twin Peaks most famous and strange scenes. 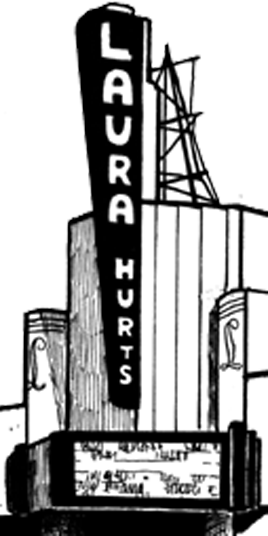 In my design concept, I subtly replaced the “Laurelhurst” wording on the theater’s neon sign, changing it to “Laura Hurts.” This references the central plot line of the television show, in which the battered body of Twin Peaks High School’s popular homecoming queen, Laura Palmer, is mysteriously discovered washed ashore, wrapped in plastic. 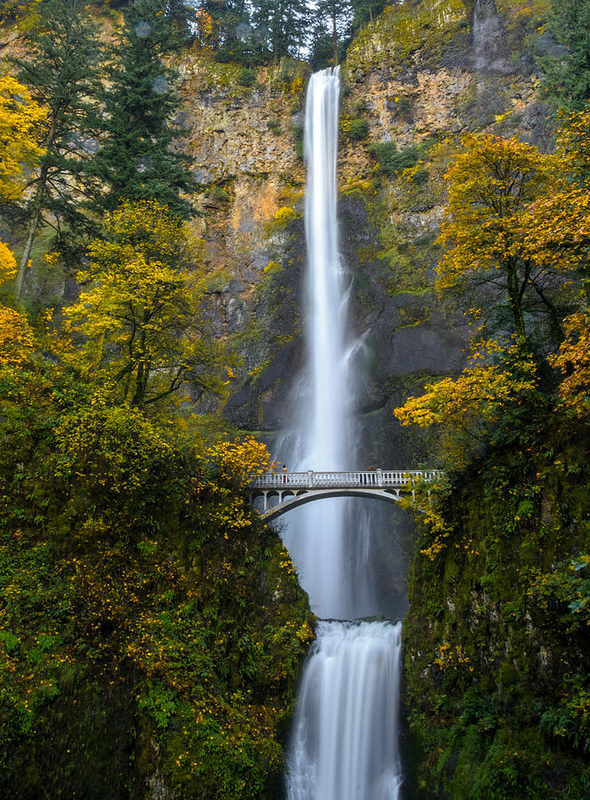 I used Multnomah Falls as a localized Oregon stand-in for Snoqualmie Falls, which appears in the opening credits of every Twin Peaks episode. 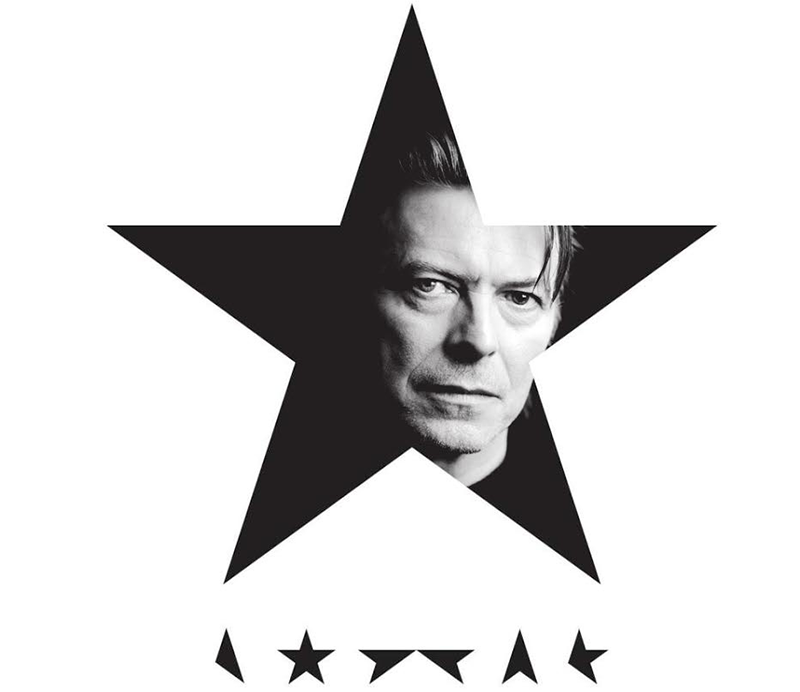 Just before David Bowie passed away, he released one last haunting studio album (his 25th), called Black Star. As he typically has done throughout his prolific, storied career, he came up with an odd character, this time dressed in a black suit with bandages covering his eyes and plastic buttons pasted on to replace them. I added several Bowie elements within the composition. First, I placed his face up in the sky, faded out like a ghost or spirit. 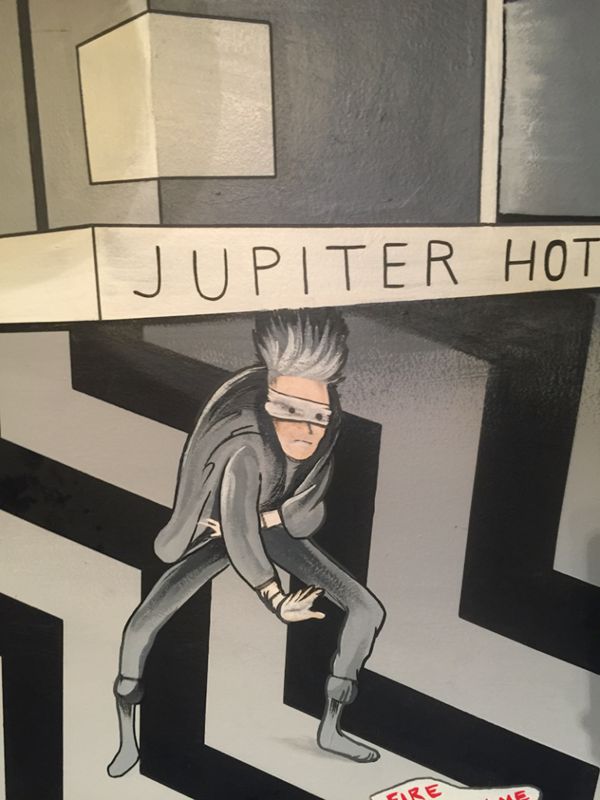 On the Jupiter Hotel sign, it says, “Look up here, I’m in heaven,” a reference to a lyric from the song, Lazarus, on his last album. Then, I added the Black Star character with the bandages. 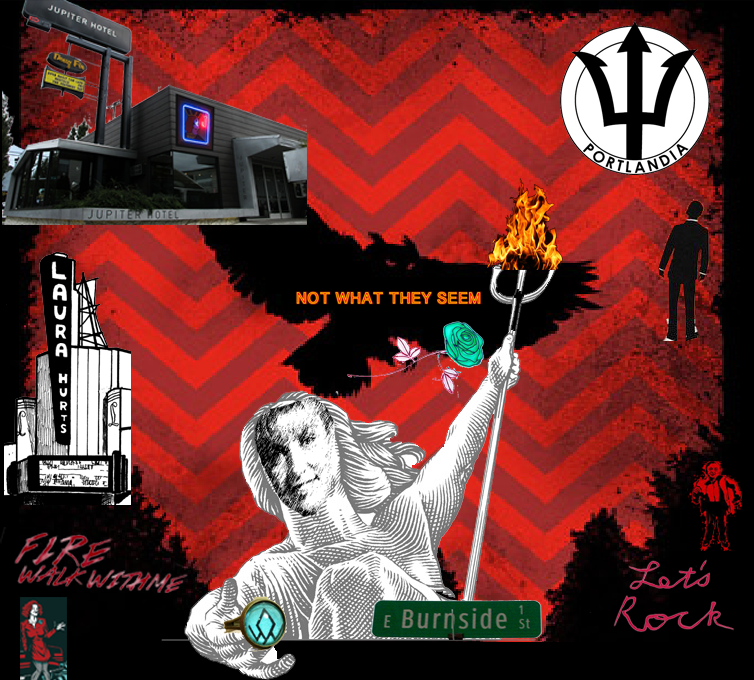 Finally, I put the black star from the album cover on the front of the Laurelhurst Theater, as if it were graffiti art. 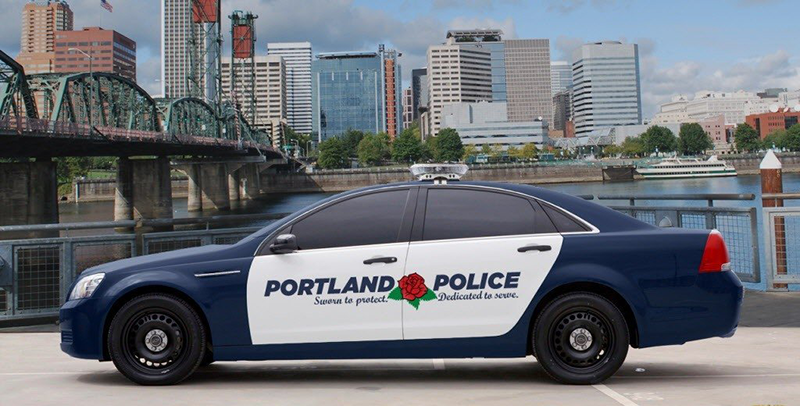 Portland is known as “The Rose City.” In Twin Peaks, a blue rose represents an unexplainable, supernatural case, almost like an X-File. Owls are commonly spotted when exploring the gorgeous Pacific Northwest wilderness that surrounds Portland and Seattle. 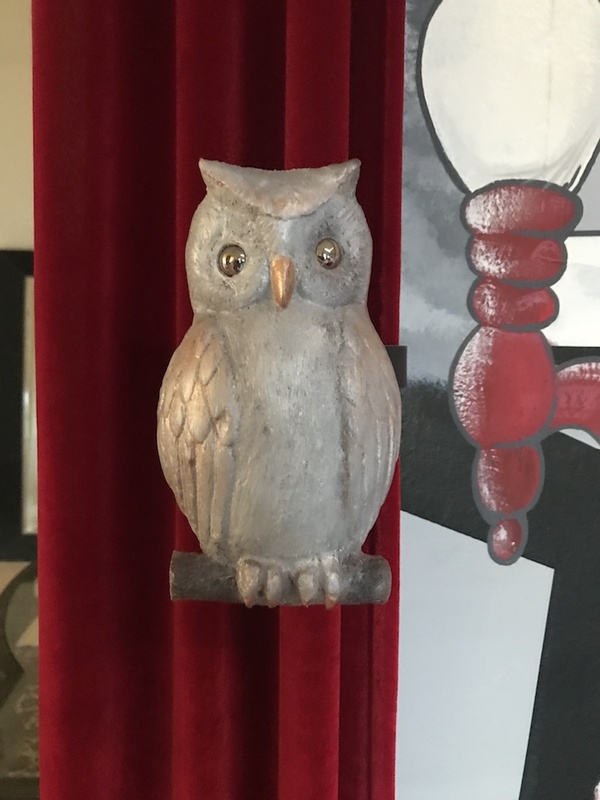 Owls also play a prominent role within Native American mythology as special creatures who can travel between the physical and spirit worlds and often represent death or a transition to the afterlife. 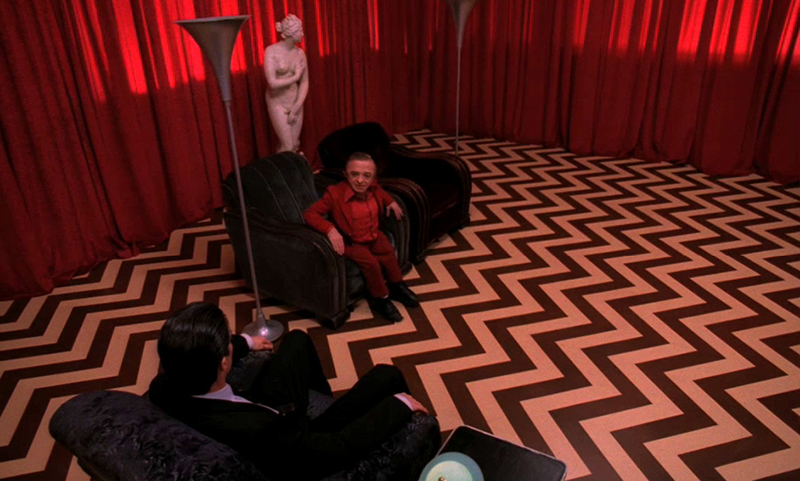 This symbolism is significant within Twin Peaks. 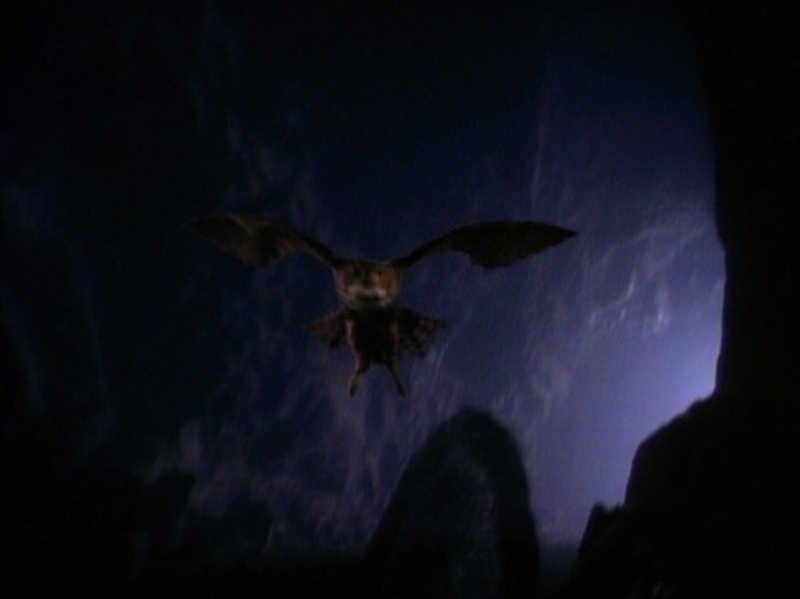 Throughout the series, there is also a recurring Native American hieroglyph symbol that depicts the basic outline of an owl, with the wings simultaneously designed to look like twin mountain peaks. 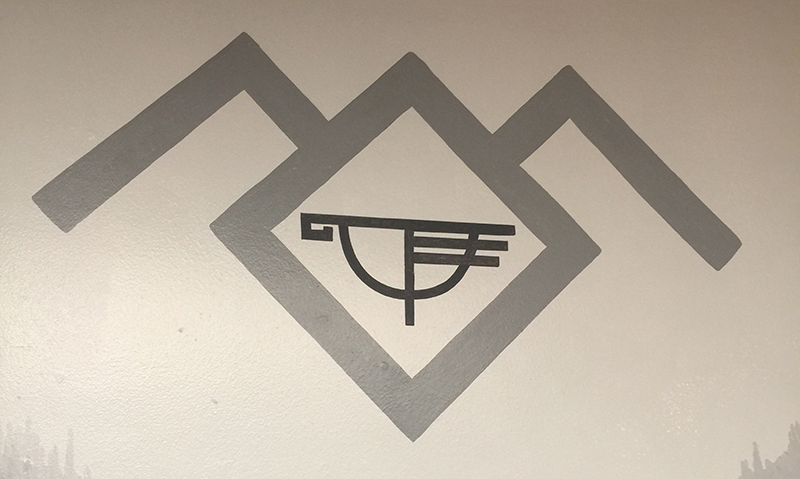 Timberline Lodge, up on Mount Hood (just outside of Portland), has a logo that similarly looks like a Native American hieroglyph. 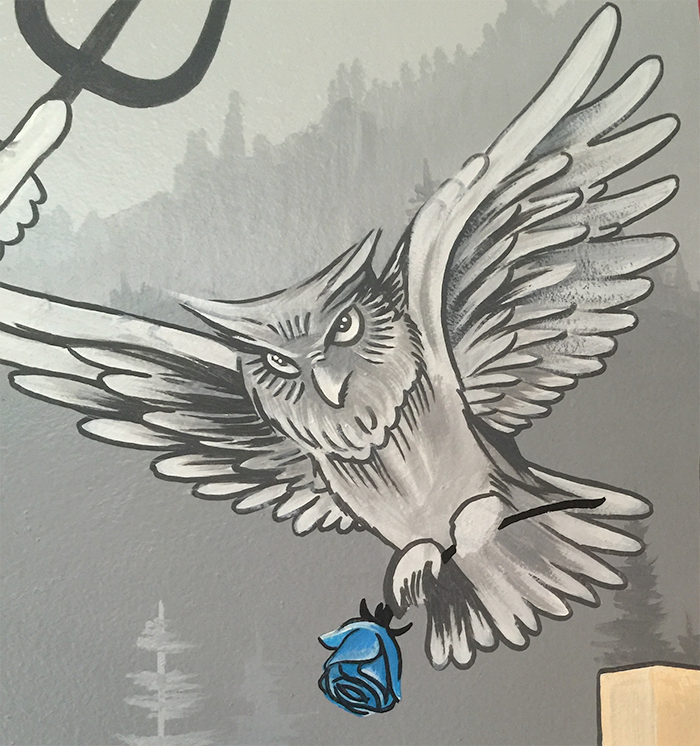 It occurred to me, one day, that these two symbols would make the perfect pairing on my mural, nesting one inside the other. 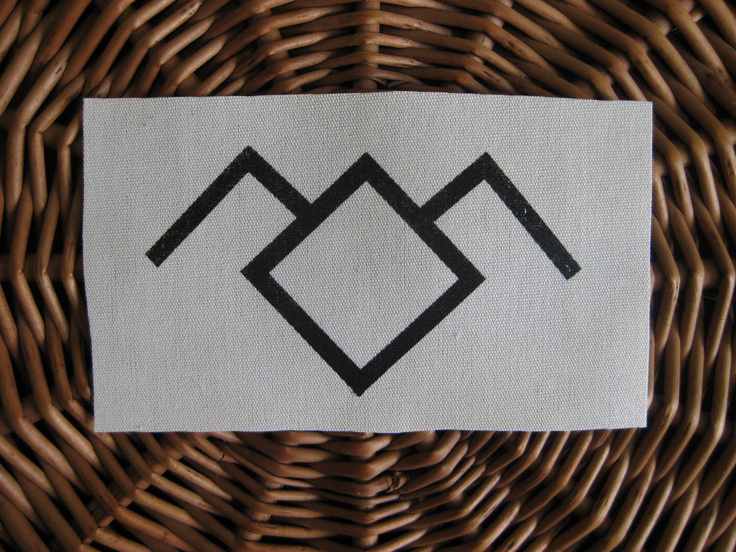 Since Timberline Lodge is on top of one of the most prominent snowy mountain peaks in the Portland skyline, the symbolic narrative becomes conveniently coherent, once again signaling a fusion of the real Portland world with the fantasy Twin Peaks world. 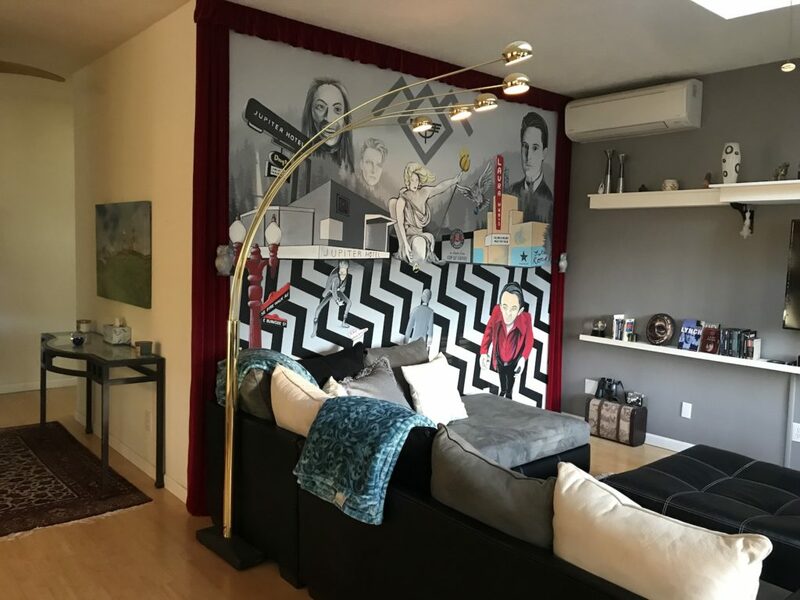 As Eric painted the actual mural on my living room wall, he leveraged his artistic visual expertise to evolve my initial concept and optimize the overall composition. Watching it gradually come to life, we worked closely together to adjust the concept as needed, while also iteratively introducing additional creative ideas. 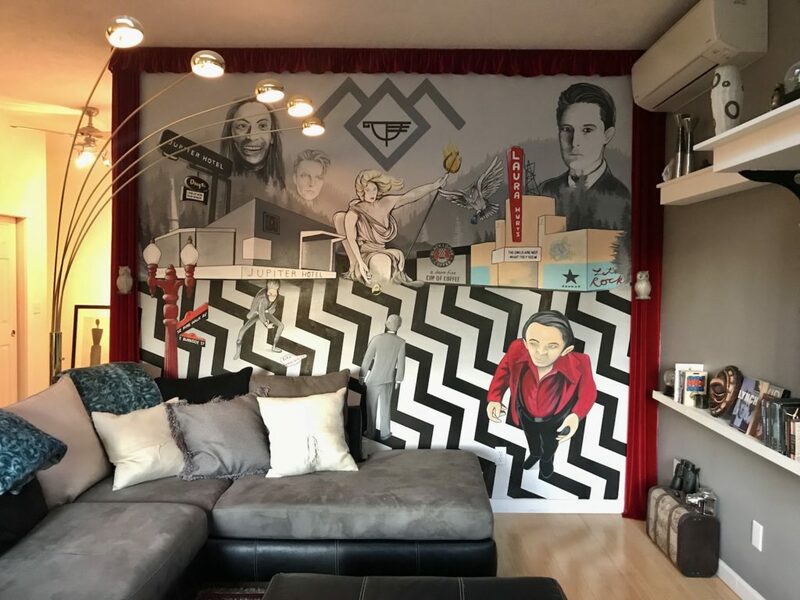 For example, Eric thought of framing the mural with actual red velvet curtains, which I am convinced will be a brilliant enhancement that truly brings the whole piece together. I created updated mockups to illustrate the various adjustments, as needed. This helped to make sure we were on the same page before he actually painted the elements on the wall. 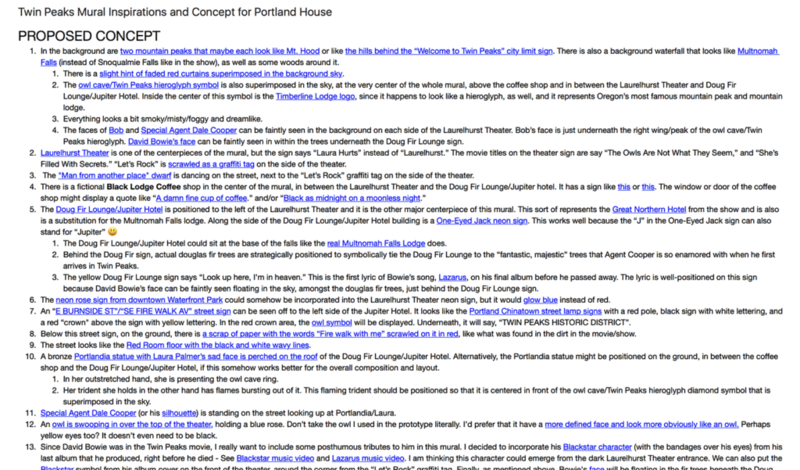 Below are two examples of the conceptual modifications that I made late in the implementation process. While re-evaluating the placement of certain elements so that the composition felt more balanced, I had the epiphany to replace the traditional green street sign in my original prototype with a more ornate red lamp post street sign like the ones that line the streets of Portland’s historic Chinatown district. 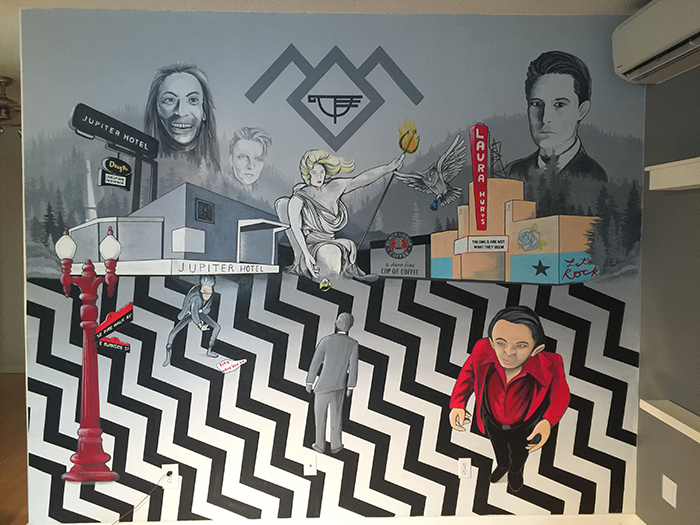 We didn’t have any greens in the mural and we needed a way to get more red on the left side of the wall to pair with the little “Man From Another Place” wearing a red suit on the right side. 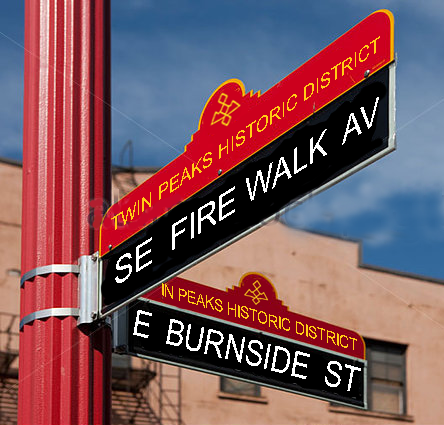 I also came to the conclusion that the mural should be set at the intersection of the real life “East Burnside” street and the fictional “Fire Walk” avenue. This would help signal my overall artistic intent of the mural, which was to seamlessly blend reality and fantasy into a dreamlike fugue state. 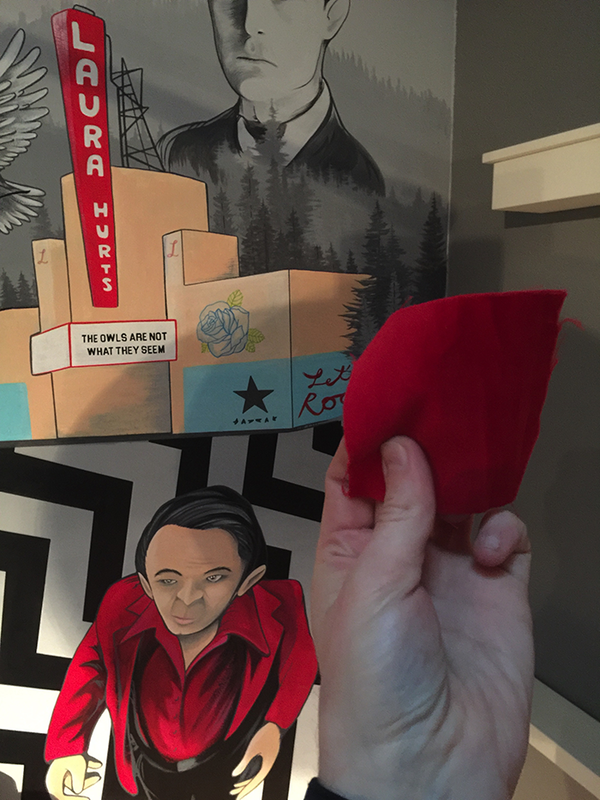 I initially had the character from Bowie’s Black Star video emerging from the Laurelhurst Theater. 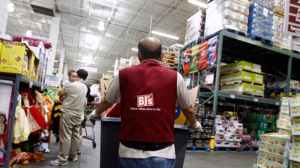 However, this would have made him too small and not prominent enough. 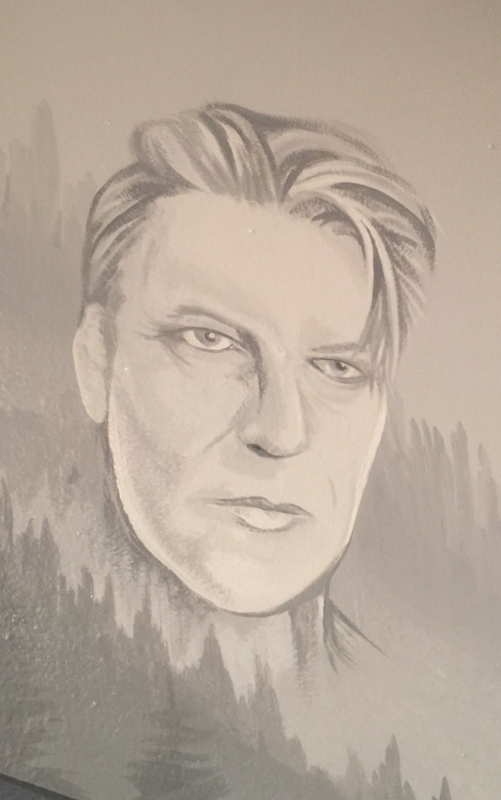 I had placed a scrap of paper on the street that said “Fire Walk With Me.” It occurred to me that we could move this Bowie character more into the foreground, on the left side of the wall, and have him interacting with that scrap of paper. 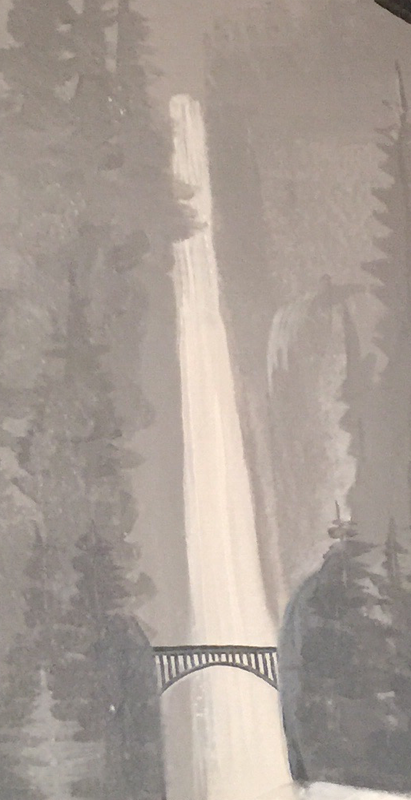 Once again, this helped to balance out the elements across the mural, and it added more intrigue, rather than just having the paper scrap placed randomly on its own. 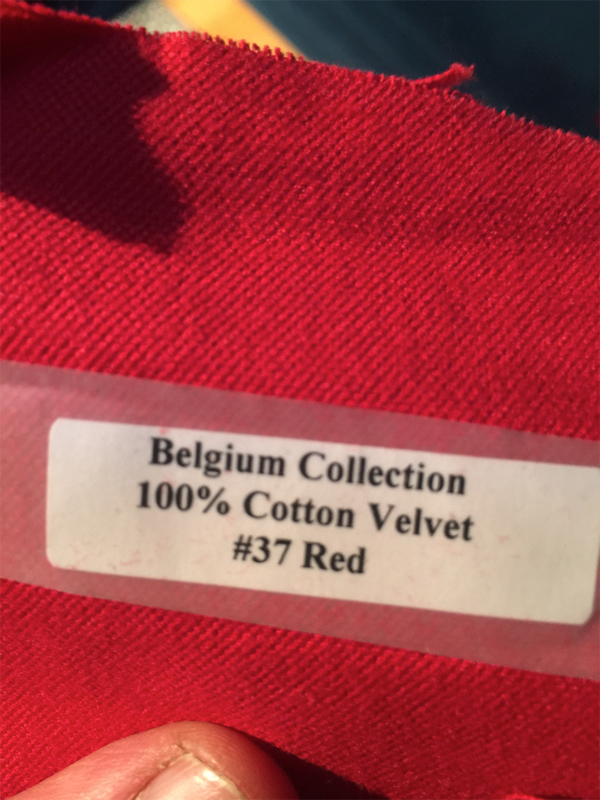 We meticulously explored the best options for framing the mural with stationary red velvet drapes. It was actually quite challenging to find the right fabric that would still look full and rippled without being so thick that it covered up key features of the mural. 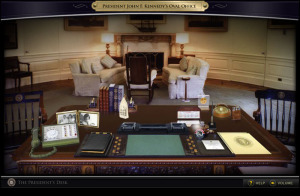 We only had about a 6-12 inch border to work with. We ultimately pinched and stiched the pleats together in order to create this desired rippled effect we were looking for. 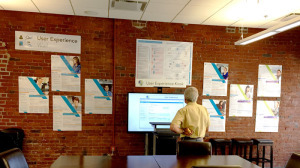 Then we hung them up using a very strong velcro. These drapes ended up being an awesome finishing touch. 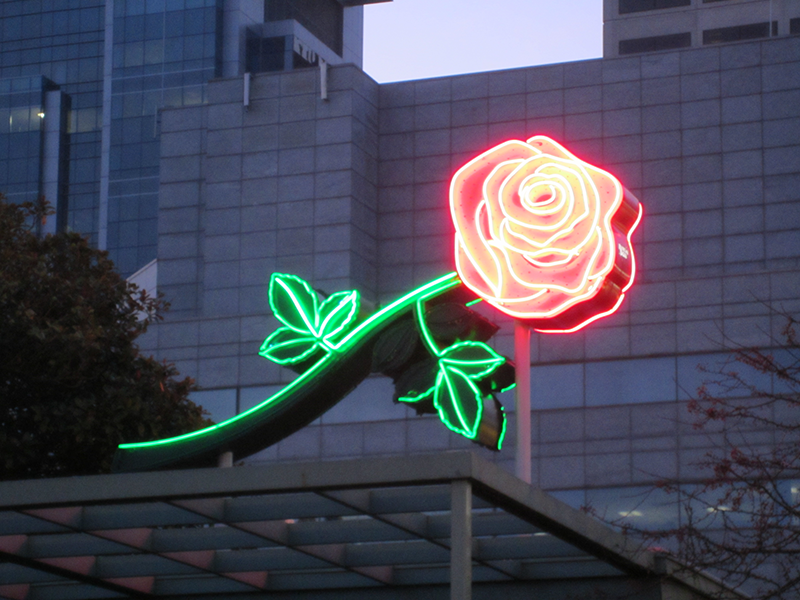 They provide a 3D art installation element to the piece that makes it even more dramatic. 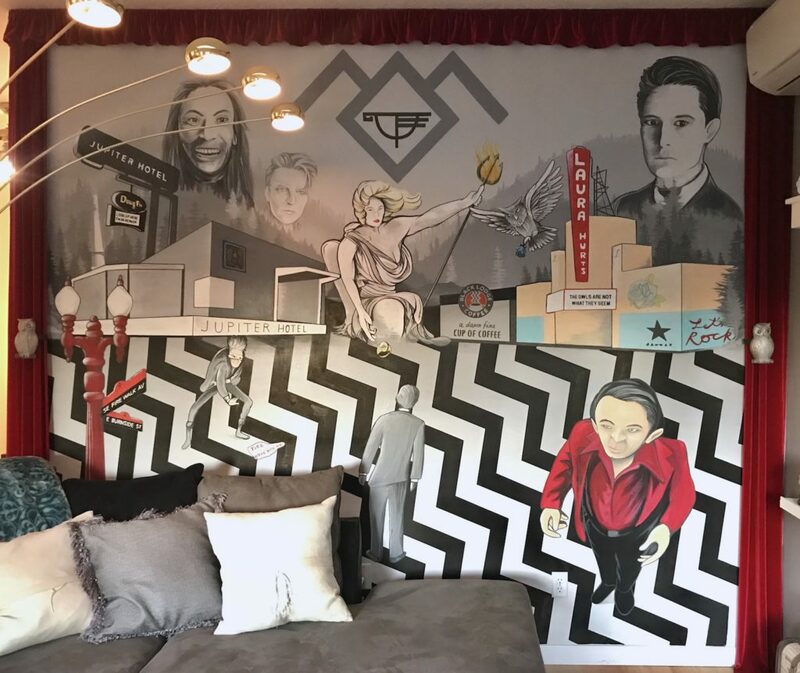 Our goal was to complement the red accents in the mural painting, while also referencing the iconic red drapes that hang in the background of the supernatural Black Lodge within Agent Cooper’s dream.